Why Just Try To Keep Up? ... Let Us Help You Get Ahead! Welcome To Docu-Type - How can we help you? Written by Janice Byer and Elayne Whitfield-Parr, this NEW book includes information and tips to help aspiring and established VAs with every aspect of starting and building a Virtual Assistant business. From naming your business, to upgrading your skills, to expanding your business, we have put together everything you need to know based on our combined years in this industry and the input of successful VAs worldwide. Read more and order your copy today! Since 1999, we have been publishing Virtual Tidbits filled with articles, links, tips and resources to help small business professionals. Now these articles and more are archived on our blog. Not sure if getting help from a Virtual Assistant is the answer for you? We understand your concern and we are here to help you make that decision and then give you the assistance you need (and MORE!). Read about the Benefits of Working With a VA.
DOCU-TYPE Administrative & Web Design Services is a professional Virtual Office Assistance, Website Design & Web Hosting company that specializes in helping small business owners get the help they deserve. We specialize in making your business life easier! For as low as $7.00 per month - find out more! Confidentiality, Reliability, & Satisfaction Guaranteed! And, let us HELP you! 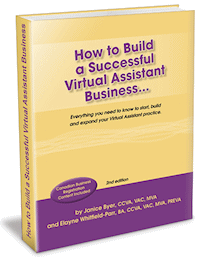 How to Build a Successful Virtual Assistant Business, written by Janice Byer and Elayne Whitfield-Parr, includes information and tips to help aspiring and established VAs with every aspect of starting and building a Virtual Assistant business. Our dream for this book is to help those who have administrative or VA-related service skills to start, operate and build a successful Virtual Assistant practice, no matter where they are located and no matter what their gender is. 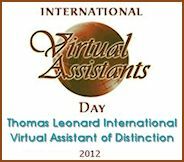 Read more about How to Build a Successful Virtual Assistant Business and order your copy today! "An important reengineering principle is that companies should focus on their core competencies and outsource everything else."